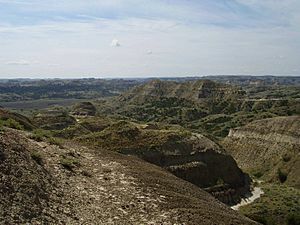 The Hell Creek Formation is an intensively-studied division of mostly Upper Cretaceous and some lower Paleocene rocks in North America, named for exposures studied along Hell Creek, near Jordan, Montana. The formation includes portions of Montana, North Dakota, South Dakota, and Wyoming. In Montana, the Hell Creek Formation overlies the Fox Hills Formation. "Pompey's Pillar" at the Pompeys Pillar National Monument is a small isolated section of the Hell Creek Formation. It is a series of fresh and brackish-water clays, mudstones, and sandstones deposited during the Maastrichtian and Danian (respectively the end of the Cretaceous period and the beginning of the Paleogene) by fluvial activity in fluctuating river channels and deltas and very occasional peaty swamp deposits along the low-lying eastern continental margin fronting the late Cretaceous Western Interior Seaway. The climate was mild, and the presence of crocodilians suggests a sub-tropical climate, with no prolonged annual cold. The famous iridium-enriched Cretaceous–Paleogene boundary, which separates the Cretaceous from the Cenozoic, occurs as a discontinuous but distinct thin marker bedding above and occasionally within the formation, near its boundary with the overlying Fort Union Formation. The world's largest collection of Hell Creek fossils is housed and exhibited at the Museum of the Rockies, in Bozeman, Montana. The specimens displayed are the result of the museum's Hell Creek Project, a joint effort between the museum, Montana State University, the University of California, Berkeley, the University of North Dakota and the University of North Carolina which began in 1998. The Hell Creek Formation in Montana overlies the Fox Hills Formation and underlies the Fort Union Formation, and the boundary with the latter occurs near the Cretaceous-Paleogene boundary, which defines the end of the Cretaceous period and has been dated to 66 ± 0.07 Ma old. Fauna characteristic of the Hell Creek (Lancian land vertebrate age) are found as high as a few meters below the boundary. The K-Pg boundary is generally situated near the contact between the upper Hell Creek and the lower Ludlow member of the Fort Union Formation, though in some areas (e.g. in North Dakota) the boundary is well within the Ludlow Member, 3 meters above the boundary with the Hell Creek in some areas. On the other hand, in some small regions of Montana, the Hell Creek Formation contains the K-Pg boundary, and extends slightly into the Paleogene. Many animals including dinosaurs lived in the Hell Creek Formation. The Hell Creek Formation has world-famous dinosaur fossil sites. Fossils are found of sea creatures from the recession and adjacent inland sea at that time. Vertebrates include dinosaurs, pterosaurs, crocodiles, champsosaurs, lizards, snakes, turtles, frogs and salamanders. Remains of fishes and mammals have also been found in the Hell Creek Formation. The formation has produced impressive assemblages of invertebrates (including Ammonites), plants, mammals, fish, reptiles (including the lizard Obamadon), Marine reptiles (including the marine reptiles like mosasaurs, plesiosaurs and sea turtles), and amphibians. 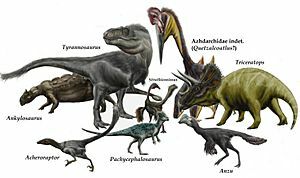 Notable dinosaur finds include Tyrannosaurus and Triceratops, ornithomimids as well, caenagnathids like Anzu, a variety of small theropods, pachycephalosaurs, ankylosaurs, crocodylomorphs and squamates, including various animal fossils unearthed in the Hell Creek Formation. The most complete hadrosaurid dinosaur ever found, an Edmontosaurus, was retrieved in 2000 from the Hell Creek Formation and widely publicised in a National Geographic documentary aired in December 2007. A few bird, mammal, and pterosaur fossils have also been found. The teeth of sharks and rays are sometimes found in the riverine Hell Creek Formation, suggesting that some of these taxa were then, as now, tolerant of fresh water. The "Lancian" fauna is more similar overall phylogenetically to East Asian and Canadian/Alaskan faunas than most Campanian North American faunas. 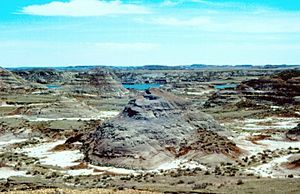 View of Hell Creek State Park, the "heart" of Hell Creek Formation. The dominant plants of the Hell Creek Formation are mainly flowering plants. It is a series of fresh and brackish-water clays, mudstones, and sandstones deposited during the Maastrichtian and Danian (respectively the end of the Cretaceous period and the beginning of the Paleogene) by fluvial activity in fluctuating channels and deltas and very occasional peaty swamp deposits along the low-lying eastern continental margin fronting the late Cretaceous Western Interior Seaway. 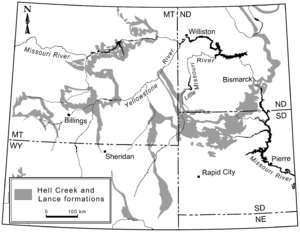 The Hell Creek Formation, as typified by exposures in the Fort Peck area of Montana, has been interpreted as a flat, forested floodplain with a relatively subtropical climate that supported a variety of plants ranging from angiosperm trees to conifers such as the bald cypress, ferns and ginkgos. The Hell Creek Formation was laid down by streams, on a coastal plain along the edge of the Western Interior Seaway. The presence of crocodilia suggests climate was subtropical; there was no cold season and probably ample precipitation. The Hell Creek Formation, Lance Formation and Scollard Formation represent different sections of the western shore of the shallow sea that divided western and eastern North America during the Cretaceous. Swampy lowlands were the habitat of various animals, including dinosaurs. A broad coastal plain extended westward from the seaway to the newly formed Rocky Mountains. These formations are composed largely of sandstone and mudstone which have been attributed to floodplain, fluvial, lacustrine, swamp, estuarine and coastal plain environments. Hell Creek is the best studied of these ancient environments. At the time, this region was subtropical, warm and moist climate. 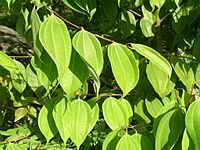 The climate was humid, with flowering plants, conifers, palmettos, and ferns in the swamps, and conifers, canopy, understory plants, Ash trees, live oak and shrubs in the forests. In northwestern South Dakota, strips of black layers deposited in the wetland environment are rich in coal, and a bright band-like layer of sand and mud from the river floodplain accumulated. Many plant species were supported, primarily angiosperms, and less commonly conifers, bald cypress, ferns and cycads. 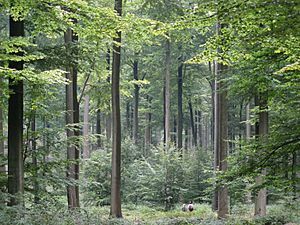 An abundance of fossil leaves are found at dozens of different sites indicating that the area was largely forested by small trees. "Pill clam". "Nut clam". "Fingernail clam". "Pea clam". Family Sphaeriidae. Bivalve. Family Anomiidae. From a marine facies ("tongue") in South Dakota. Oyster. Family Ostreidae. 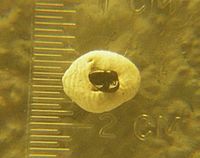 Collected from a marine facies ("tongue") in South Dakota. Bivalve. Family Cardiidae (cockle). Collected from a marine facies ("tongue") in South Dakota. Bivalve. Present members of this genus are rock borers. Collected from a marine facies ("tongue") in South Dakota. Bivalve. Family Cultellidae. Collected from a marine facies ("tongue") in South Dakota. Ammonite. From a marine facies ("tongue") in South Dakota. Microconch of an ammonite. From a marine facies ("tongue") in South Dakota. Ammonite. From a marine facies ("tongue") in South Dakota. Other attributes: specimen has hooks on its shell. Uncertain or tentative taxa are in small text; crossed out taxa are discredited. Anura indet. consists of material not currently assigned to any genus of frog. Material of Caudata indet. is not currently assigned to any genus. Habrosaurus is a sirenid amphibian. Opisthotriton is classified as a Batrachosauroididae. Scapherpeton is a scapherpetonid that is very common in the Hell Creek Formation. 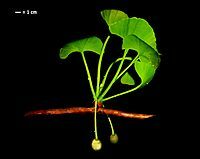 18 specimens are tentatively assigned to Acipenser sp. Acipenser sp. is tentatively referred to the genus. A long-snouted slender fish classified as an aspidorhynchid. 2610 specimens have been assigned to Kindleia, making it an extremely common genus. Kindleia is a genus assigned to Amiidae, along with Melvius and Amia. A lepidosteid that is very common in the Hell Creek Formation. A genus of prehistoric sharks in the family Hybodontidae. It makes up 0.4% of the remains of the vertebrates of the Hell Creek Formation. Lower to upper Hell Creek Formation. 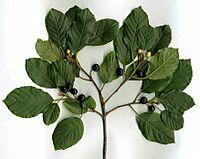 1677 specimens previously assigned to M. bipartitus. Is an anacoracid batoid rajiform related to guitarfishes. Described on the basis of teeth formerly assigned to the species M. bipartitus. The material assigned to Myledaphus bipartitus and makes up 16.5% of the vertebrate remains. A member of Ginglymostomatidae. Formerly assigned to the genus Brachaelurus. A wobbegong-like shark. Formerly assigned to Squatirhina. The remains consist of 0.05% of the vertebrates. Also known from the Lance Formation. A paleo-population study is one of the most difficult of analyses to conduct in field paleontology. Here is the most recent estimate of the proportions of the eight most common dinosaurian families in the Hell Creek Formation, based on detailed field studies by White, Fastovsky and Sheehan (1998). Pie chart of the time averaged census for large-bodied dinosaurs from the entire Hell Creek Formation in the study area. Outcrops sampled by the Hell Creek Project were divided into three sections: lower, middle and upper slices. The top and bottom sections were the focus of the PLoS One report, and within each portion many remains of Triceratops, Edmontosaurus, and Tyrannosaurus were found. Triceratops was the most common in each section, but, surprisingly, Tyrannosaurus was just as common, if not slightly more common, than the hadrosaur Edmontosaurus. 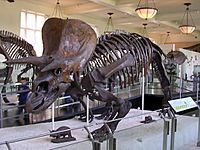 In the upper Hell Creek section, for example, the census included twenty two Triceratops, five Tyrannosaurus, and five Edmontosaurus. The dinosaurs Thescelosaurus, Ornithomimus, Pachycephalosaurusand Ankylosaurus were also included in the breakdown, but were relatively rare. Other dinosaurs, such as Sphaerotholus, Denversaurus, Torosaurus, Struthiomimus, Acheroraptor, Dakotaraptor, Pectinodon, Richardoestesia, Paronychodon, Anzu, Leptorhynchos and Troodon, were reported as being rare and are not included in the breakdown. 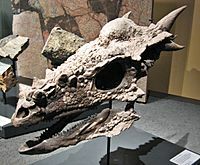 The dinosaur collections made over the past decade during the Hell Creek Project yielded new information from an improved genus-level collecting schema and robust data set that revealed relative dinosaur abundances that were unexpected, and ontogenetic age classes previously considered rare. We recognize a much higher percentage of Tyrannosaurus than previous surveys. Tyrannosaurus equals Edmontosaurus in U3 and in L3 comprises a greater percentage of the large dinosaur fauna as the second most abundant taxon after Triceratops, followed by Edmontosaurus. This is surprisingly consistent in (1) the two major lag deposits (MOR loc. HC-530 and HC-312) in the Apex sandstone and Jen-rex sand where individual bones were counted and (2) in two-thirds of the formation reflected in L3 and U3 records of dinosaur skeletons only. Triceratops is by far the most common dinosaur at 40% (n = 72), Tyrannosaurus is second at 24% (n = 44), Edmontosaurus is third at 20% (n = 36), followed by Thescelosaurus at 8% (n = 15), Ornithomimus at 5% (n = 9), and Pachycephalosaurus and Ankylosaurus both at 1% (n = 2) are relatively rare. An ankylosaur. Also found in the Lance and Scollard Formations. An undescribed Pachycephalosaur is present in North Dakota. A pachycephalosaur, possibly synonymous with Pachycephalosaurus. A pachycephalosaur. Also found in the Lance Formation. A pachycephalosaur, possibly synonymous with Prenocephale. A pachycephalosaur, possibly synonymous with Pachycephalosaurus. Also found in the Lance Formation. 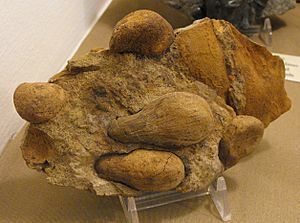 Indeterminate ceratopsid specimens are extremely common. 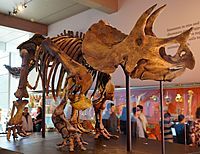 8.31% of all vertebrate remains from the Hell Creek Formation are unassigned ceratopsids. A ceratopsian possibly synonymous with Triceratops. A rare ceratopsid. A ceratopsian. Also found in the Evanston, Frenchman, Lance, Laramie, and Scollard Formations. Also found in the Frenchman and Lance Formations. Indeterminate hadrosaurid remains are very common in the Hell Creek Formation. A lambeosaurine hadrosaur similar to Parasaurolophus, possibly an undescribed species, may have lived in the Hell Creek Formation however lack of more evidence makes this unclear as lambeosaurine fossils are rare in Hell Creek and in Laramida as a whole. 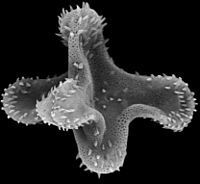 However, the lambeosaurines were thriving in Asia and Europe during the end of the Cretaceous. A hadrosaur. Also found in the Denver, Frenchman, Lance, Laramie, and Scollard Formations. A small ornithopod. Also found in the Frenchman, Lance, Laramie, and Scollard Formations. A theropod closely related to, and of overall similarity to, the feathered Asian genus Mononykus. Theropod tracks have been found in South Dakota. 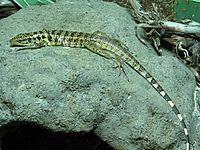 An unnamed alvarezsaurid, closely related to the Asian genus Mononykus, is known from Montana. A second footprint that may have been made by a specimen of Tyrannosaurus was first reported in 2007 by British paleontologist Phil Manning, from the Hell Creek Formation of Montana. This second track measures 72 centimetres (28 in) long, shorter than the track described by Lockley and Hunt. 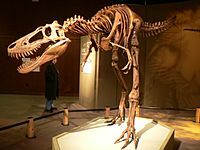 Whether or not the track was made by Tyrannosaurus is unclear, though Tyrannosaurus is the only large theropod known to have existed in the Hell Creek Formation. A tyrannosaur, known from several specimens including a juvenile nicknamed "Jane". Also found in the Denver, Frenchman, Hill Creek South, Javelina, Lance, Ferris, Livingston, McRae, North Horn, Scollard, Willow Creek Formation, and also found in Lomas Coloradas Formations. A large ornithomimid similar to Gallimimus in size. Also found in the Lance Formation. 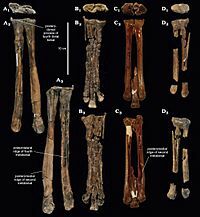 Largely undescribed ornithomimid fossils originally classified as Ornithomimus velox, but later regarded as indeterminate. It was thus one of the largest known oviraptorosaurs and the largest known from North America. Material previously assigned to Caenagnathidae indet. is now placed in the genus Anzu. 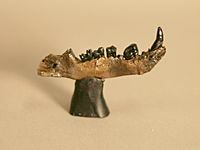 Leptorhynchos is an extinct genus of caenagnathid. Historically, numerous teeth have been attributed to various dromaeosaurid and troodontid taxa with known body fossils from only older formations, including Dromaeosaurus, Saurornitholestes and Troodon. However, in a 2013 study, Evans et al. 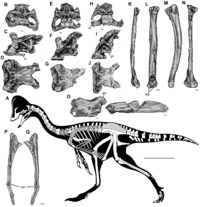 concluded that there is little evidence for more than a single dromaeosaurid taxon, Acheroraptor, in the Hell Creek-Lance assemblages, which would render these taxa invalid for this formation. 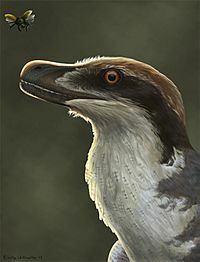 This was disproved in a 2015 study, DePalma et al., when they described the new genus Dakotaraptor, a large species of dromaeosaur. 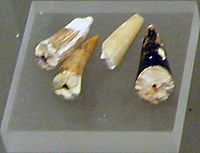 Though it should be noted as mentioned earlier that fossilized teeth of various troodontids and coelurosaurs are common throughout the Hell Creek Formation; the best known examples include Paronychodon, Pectinodon and Richardoestesia respectively. A velociraptorine dromaeosaurid. Teeth previously referred to various Campanian dromaeosaurids Saurornitholestes and Dromaeosaurus, frequently found throughout the formation, probably belong to this one species. Evans et al. conclude that there is little evidence for the former two taxa being present in the Hell Creek-Lance assemblages. An avisaurid tentatively referred to A. archibaldi based on its size. UNSM 50665, a left tarsometatarsus missing proximal end, trochleae II and III. A dromaeosaurid. Second largest dromaeosaurid known. A hesperornithiform also found in the Lance Formation. A primitive hesperornithiform. 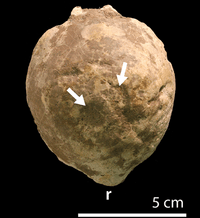 The Hell Creek specimen was referred to the same unnamed taxon as RSM P 2315.1 from the Canadian Frenchman Formation. RSM P 2315.1 was later made the holotype of Brodavis americanus. May be a synonym of Potamornis. Records of pterosaur remains from the Hell Creek Formation are two indeterminate specimens, which have been recorded from North Dakota but not described (Johnson et al., 2000; Pearson et al., 2002). A single azhdarchid neck bone may belong to the genus Quetzalcoatlus, thought are not diagnostic to the generic level. Extinct genus of crocodylians that lived from the Late Cretaceous to the Eocene in North America. Extinct genus of gavialoid crocodilian which existed during the Late Cretaceous and early Paleocene. 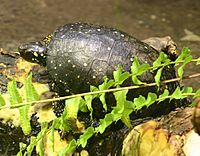 Extinct genus of aquatic turtles belonging to the family Adocidae. 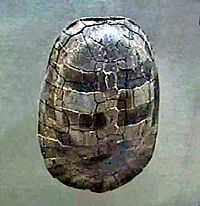 Extinct genus of baenid turtle. A relative of extinct family of cryptodiran turtles. Trionychidae related to the softshell turtle. A kinosternoid related to the Central American river turtle. A genus of softshell turtles belonging to the family Trionychidae. Largest baenid turtle in Hell Creek Formation. A platynotan lizard of uncertain phylogenetic placement, also known from the Lance Formation. An alethinophidian snake of uncertain phylogenetic placement. A polyglyphanodontian lizard of uncertain phylogenetic placement. Also known from the Lance Formation. A large Monstersauria lizard, closely related to today's varanid lizards. It was the largest lizard in the Hell Creek formation. A multituberculate of uncertain phylogenetic placement. It was a member of the extinct order Multituberculata. An alphadontid. 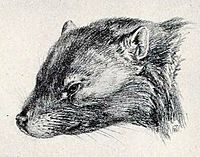 genus of small, primitive mammal that was a member of the Metatheria, a group of mammals that includes modern-day marsupials. A stagodontid. genus of Stagodontidae marsupials from the Late Cretaceous of North America. 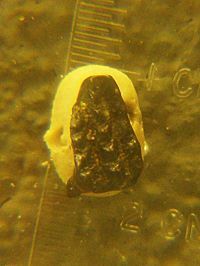 A genus of the four extinct species believed to be the earliest example of a stem-eutherian. A eutherian of uncertain phylogenetic placement. 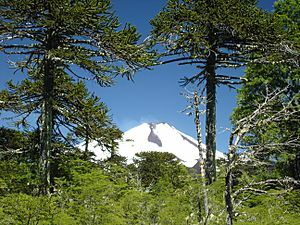 Although the first representatives of leafy trees and true grasses emerged in the Cretaceous, the flora was still dominated by conifers like Araucaria. The Hell Creek Formation was a low flood plain at the time before the sea retreated, and in the wet ground of the dense woodland, laurels, sycamores, beech, magnolias, and palm trees grew. Ferns and moss grew in the forest understory. 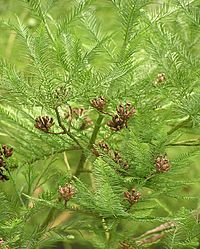 Plant fossils from the upper early Paleocene of the Hell Creek Formation include the ferns Botrychium, Woodwardia, Osmunda, Onoclea and Azolla; Conifers Metasequoia, Cupressaceous conifers and Glyptostrobus; the monocot Limnobiophyllum (a relative of duckweeds); and the dicots Cercidiphyllum and Platanus. 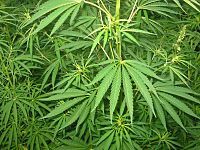 There are numerous types of leaves, seeds, flowers and other structures from Angiosperms, or flowering plants. The Hell Creek Formation of this layer contains 300 tablets or more of plants. 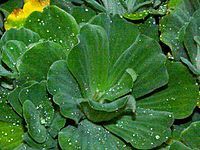 Angiosperms are by far the most diverse and dominant flora of the entire population, about 90 percent. However, the evergreens included conifers, ginkgo, bald cypress, and cycads. Flowering plants included a variety of trees that no longer exist. Today Hell Creek's flora is hardwood forest mixed with deciduous and evergreen forest and apparently similar to then, but with a closer look, the current plant community is distinct. In sharp contrast to Montana today, the presence of palm trees meant the climate was warmer then. Dr. Kirk Johnson (Scientist) claims that there are no grasses, oaks, maples, or willows in the Hell Creek Formation. Ferns are uncommon in the majority of the formation, however there is a great increase in the abundance of fossil fern spores in the two centimeters of rock that directly overlies the impact fallout layer (the famous K-T boundary layer). This increase in fern spore abundance is commonly referred to as "the fern spike" (meaning that if the abundance of spores as a function of stratigraphic position were plotted out, the graph would show a spike just above the impact fallout layer). Johnson also found that the majority of the angiosperm genera in the Hell Creek Formation are now extinct. He also believes that, very roughly, 80% of the terrestrial plant taxa died out in what is now Montana and the Dakotas at the K/T boundary. Many of the modern plant affinities in the Hell Creek Formation (e.g., those with the prefix "aff." 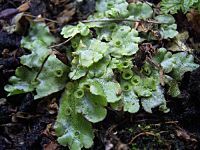 or with quotes around the genus name) may not in reality belong to these genera; instead they could be entirely different plants that resemble modern genera. 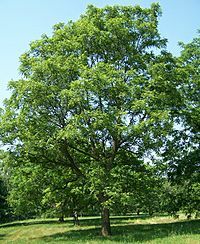 Therefore, there is some question regarding whether the modern Populus or Juglans, as two examples, actually lived in the late Cretaceous. Compared to the rich Hell Creek Formation fossil plant localities of the Dakotas, relatively few plant specimens have been collected from Montana. A few taxa were collected at Brownie Butte Montana by Shoemaker, but most plants were collected from North Dakota (Slope County) and from South Dakota. "TYPE" after the binomial means that it is represented by a type specimen found in the Yale-Peabody Museum collections. "YPM" is the prefix for the Yale-Peabody Museum specimen number. ferns found in Hell Creek. Cycads also found in Hell Creek. 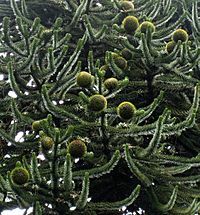 Monkey-puzzle leaves are found in Hell Creek. 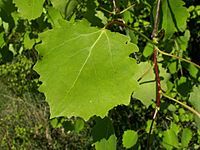 Ginkgo (uncommon) found in Hell Creek. Various angiosperms found in Hell Creek. 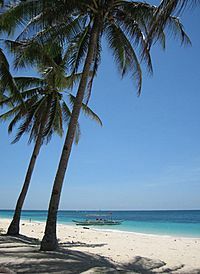 Palm trees means the climate was warmer than now. Redwood seed cones are known from Hell Creek. 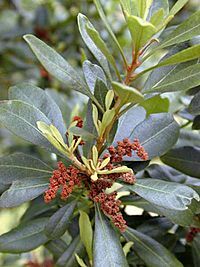 Laurus are found in Hell Creek. Cercidiphyllum are found in Hell Creek. 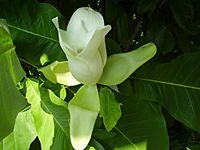 Magnolia is commonly found in Hell Creek. Casts of Dawn Redwood seed cones are known from the Hell Creek. Abundant at Brownie Butte, Montana. 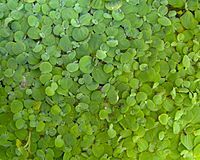 A prehistoric species of water lettuce, previously assigned to the genus Pistia. Casts of Monkey-puzzle leaves are found in Hell Creek. 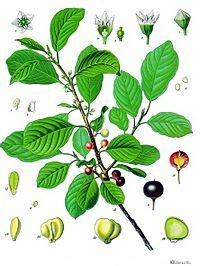 Included in "Ficus" affinis by L. Hickey. 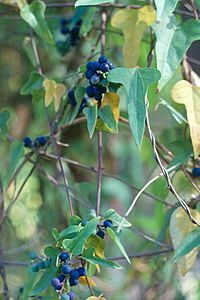 Belongs in Rhamnaceae (modern buckthorns and Ceanothus). 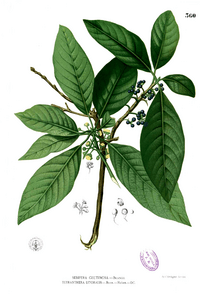 Some other specimens referred to Cinnamomum sezanensis(?) sp. 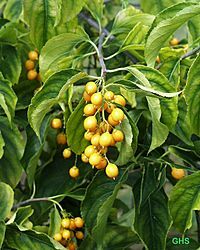 ), a real cinnamon bush. Johnson, 1996. 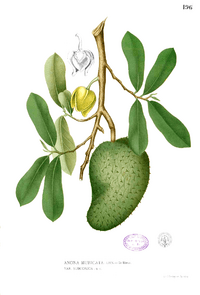 In the Magnoliidae: a common taxon. 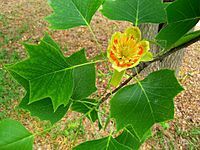 May be related to today's tulip tree (yellow poplar). Johnson, 1996. In the Lauraceae: a common taxon. Johnson, 1996. In the Platanaceae: Hamamelididae. A common taxon. 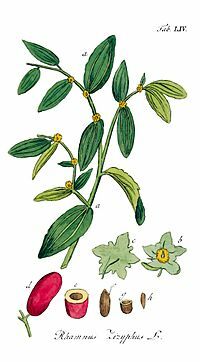 Included within "Cissus" marginata. May be in the Platanaceae. This could be a real Vitus (a real grape). Incertae sedis. Johnson, 1996. A broad leaf, probably in the Laurales. A common taxon. Type specimen was found near a Tyrannosaurus skeleton in South Dakota. In Platanales, according to Leo Hickey. Johnson, 1996. In the Platanaceae: Hamamelididae (related to today's Sycamore). A common taxon. This species was thought to occur only in southern Wyoming flora, but Leo Hickey claims it is found further north in Montana and the Dakotas. The only Hell Creek Formation cycad. Uncommon. A distant living relative is our sago palm. 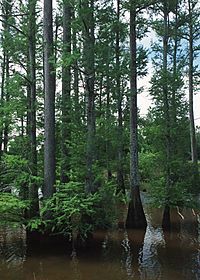 Related to today's bald cypress. Related to today's ginger plant. 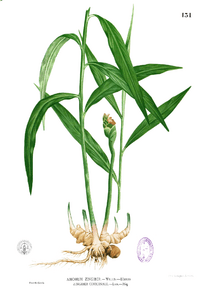 Its closest living relative is the Asian genus Alpinia. Some Hell Creek Formation. specimens show damage from hispine beetles ("leaf beetles" (Wilf et al., 2000)). One of the most common plant taxa in the Hell Creek and Lance Formations. Common at Brownie Butte, Montana. 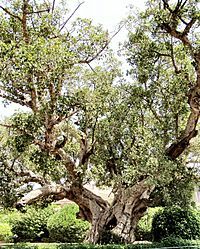 If it is close to real Dryophyllum then it is a beech/chestnut-like tree (Fagaceae). 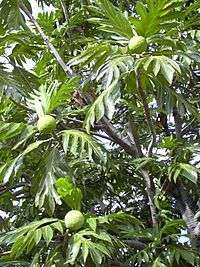 It may also be a walnut-like tree (Juglandaceae). Angiosperm. Produces large seed pods. Hell Creek formation is featured in several books, for example in the book The Last Days of Dinosaurs by Czech writer Vladimír Socha. Hell Creek Formation Facts for Kids. Kiddle Encyclopedia.